The Vallicelliana Library is housed in a building by the famous architect Francesco Borromini (1599–1667), the Oratorio dei Filippini. The library’s holdings mostly focus on the history of the Catholic Church, and in particular on the Reform and Counter Reform, on Medieval history and on paleography. The Vallicelliana also preserves a rich collection of manuscripts, which includes remarkable Medieval and humanist items. Since the 1990s, the library holding has also included photographic collections by famous photographers such as Giorgio Sommer, Giulio Brogi, Giorgio Conrad, Bonfils and many others. 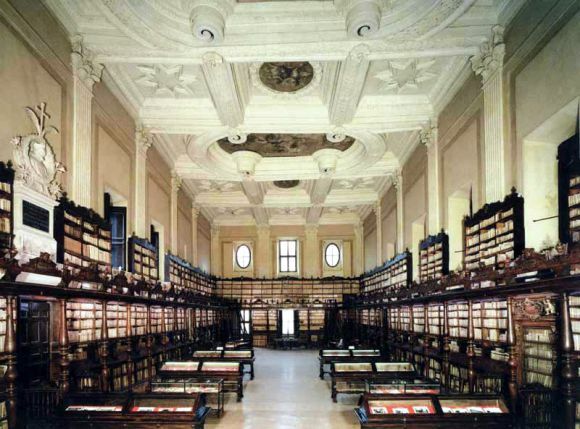 The Vallicelliana Library is under the authority of the Ministry of Cultural Heritage and Activities and Tourism.